Warehouse in Kholmsk, S= 7000 м2. Warehouse #3 in Kholmsk, S= 3600 м2. Administrative building, S= 2420 м2 ) with shops (S= 7200 м2) in Yuzhno-Sakhalinsk. Reconstruction of Block of shops, second stage, litter K, 4 storeys “Warehouse S=2300m2” on the territory of JSC “Sakhalinremflot” in Kholmsk. Repurposing of Refrigerator building. Covered parking. Boiler. 3 warehouses. Pumping station. Administrative building Block A, Б-В in Kholmsk. Road with bridge across Yazychnitsa river in Kholmsk. Open parking for technological transport in Kholmsk. Water bunkering complex in Kholmsk, capacity 800 m3 of water. Shifting of water supply lines, heat supply and power supply lines. Warehouse #4 in Kholmsk, S= 600 м3. Fuel depot in Kholmsk, capacity 14 000 м3. Open area with rack for decanting oil products to/from tanks. Breakwater (107 m) in the Northern Harbour of Kholmsk Port. Roof repairment with membrane on Refrigerator building and Block of Shops in Kholmsk. Construction of ventilated façade of Administrative building in Yuzhno-Sakhalinsk, administrative building on Mira avenue, 424 in Yuzhno-Sakhalinsk, 2 storey administrative building in Kholmsk. Repairment of berth, 26 meters long. Repairment of water supply system in SWSP. Repairment of access roads with asphalt and concrete surface. Repairment of berth’s crane beams. Repairment of upper parts of berths. Repairment and replacement of mooring stands. Repairment of 2 storey administrative building in Kholmsk. Repairment of engineering utilities and facilities on the territory of Kholmsk Fish Port. Our company makes preparatory works and analyzes design solutions for bottom dredging works. Together with its partners, the company does any kind of bottom dredging works. 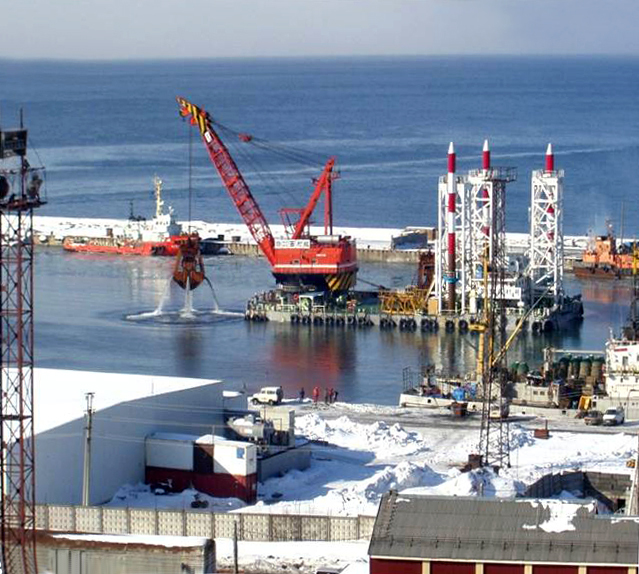 In 2002 together with Japanese company “Marubeni Corporation” and “Pentaocean” did bottom dredging works and lifted sunk vessels in Kholmsk Marine Fishing Port – future base of our company - Sakhalin Western Seaport. We made it possible for ice – class vessels with 8.5 meters draught to call in the port. It allowed organize all year round oil production and onshore supply for Molikpaque platform. Thousands of cubic meters of rock was dredged and after that water depth became 9 meters in access channel and 10 meters in the maneuvering zone of port water body. Finally, Sakhalin Western Seaport became the deepest on the island and might access vessels with deadweight up to 10 000 tons.